Skin tag removal is quick, safe and effective with little or no signs of scarring. Skin tags are benign skin lesions that can occur for no apparent reason in some cases although they normally develop on people who are obese or who have Type 2 Diabetes. People with obesity tend to be affected the most due to excess folds of skin such as the underarms or neck where the skin rubs continuously against itself. 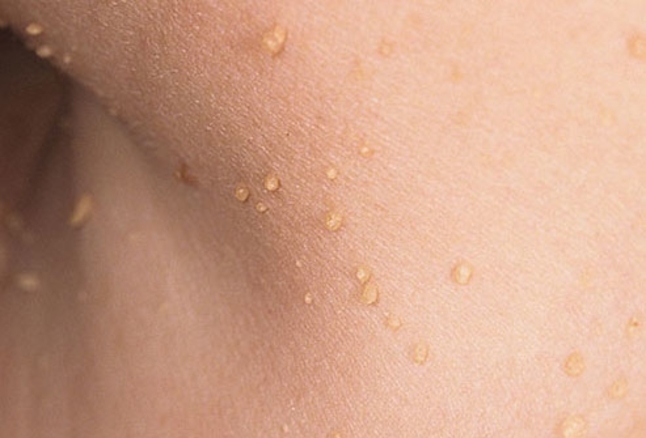 Skin tags can occur on men and women. Due to hormonal changes, women can also develop them during pregnancy. Skin tags are common yet harmless skin growths. They are small, soft, skin coloured collagen fibres that protrude off the skin. They usually occur on underarms, neck, eyelids, around the breast and under the groin. Can Skin tags become a problem? Skin tags are harmless and don’t cause much discomfort unless they catch onto jewellery/clothing, affected during shaving and of course, if they are affecting a persons confidence. If there is a lack of blood supply, they will tend to fall off themselves. We recommend you visit your GP in the first instance. A removal of skin tags in most cases is seen as a cosmetic procedure and you maybe required to remove this at a private practice. It is highly advisable that you do not attempt to remove them yourself as uncontrolled and excessive bleeding can occur. Our highly qualified Aesthetic practitioners use a Fibroblast electrode (vaporising the excess skin) to remove the skin lesion. We use a localised numbing gel prior to the procedure and it normally takes a few minutes to remove a single a skin tag. Yes. We use a topical anaesthetic before applying the Fibroblast electrode to the skin. In most cases, the skin tag can be removed in one session however in rare cases depending on the size of the skin lesion, 2 sessions maybe required. A consultation is required prior to the procedure which is £25 however if you decide to go ahead with the procedure and you are suitable for the treatment, we waive the consultation fee and you are only charged for the treatment itself.